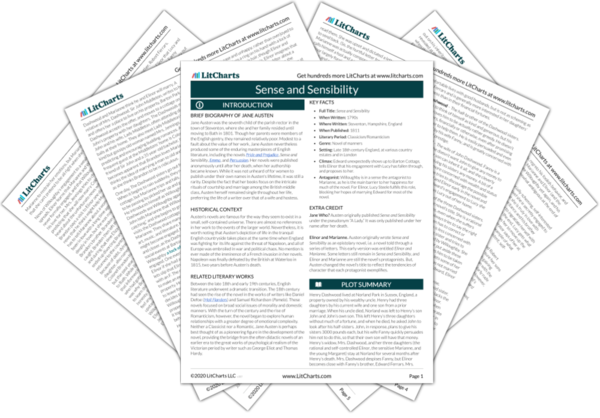 Instant downloads of all 942 LitChart PDFs (including Sense and Sensibility). 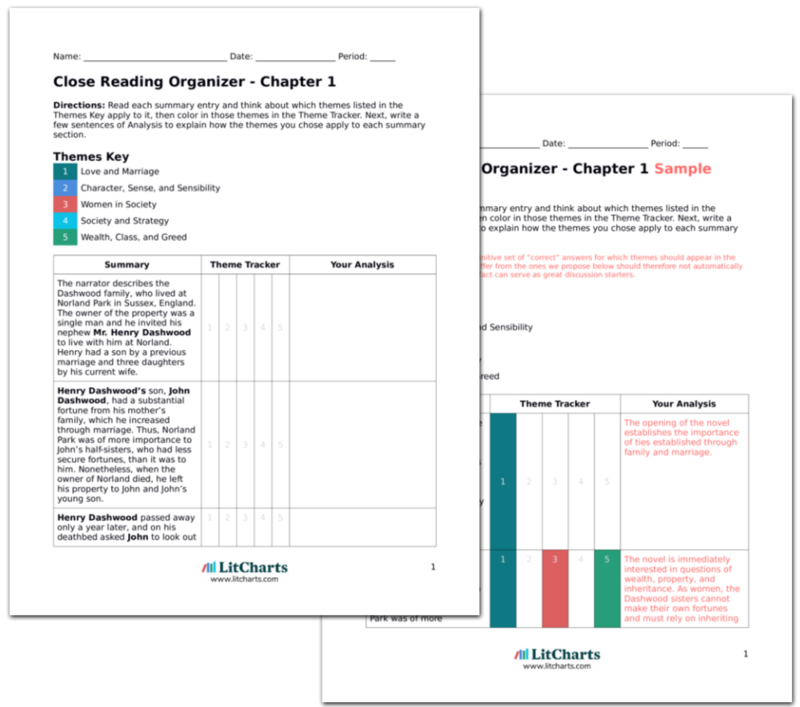 LitCharts assigns a color and icon to each theme in Sense and Sensibility, which you can use to track the themes throughout the work. Lucy and Edward were both equally happy and grateful to Elinor and Colonel Brandon. After this development, Elinor felt that she should pay a visit to Fanny, even though she did not particularly want to see her. She went alone and John invited her in to see Fanny. Elinor feels a social obligation to visit her sister-in-law Fanny, even though she dislikes her. John was astonished about the news of Colonel Brandon’s gift and wondered what Brandon’s motive was. Elinor said Brandon simply wanted “to be of use to Mr. Ferrars.” John cautioned Elinor not to speak of Edward with Fanny, as it would upset her. John cannot conceive of generosity without some kind of motive. The idea of Brandon simply giving away wealth is unfathomable to him. John said that Mrs. Ferrars was unaware of the recent news and said that he thought she and Edward would reconcile when he married Lucy. He said that Mrs. Ferrars was “one of the most affectionate mothers in the world,” and told Elinor that now Robert was planning to marry Miss Morton. John has a very different idea of Fanny’s character than Elinor (and, likely, the reader). Mrs. Ferrars is determined to have one of her sons marry wealthy, and so now plans for Robert to marry Miss Morton. Elinor asked if Miss Morton had any choice in the matter, but John said that there was no difference between Robert and Edward from her point of view, as he had received Edward’s former fortune. John then told her that, although Mrs. Ferrars would have opposed a union between Edward and Elinor, it would have been preferable to her to the engagement with Lucy. Elinor is upset by the notion that Miss Morton, as a woman, seems to have no say in her marriage. John, though, can’t see why she should care, because the main thing that matters to him in marriage is money, and Robert now has Edward’s former fortune. 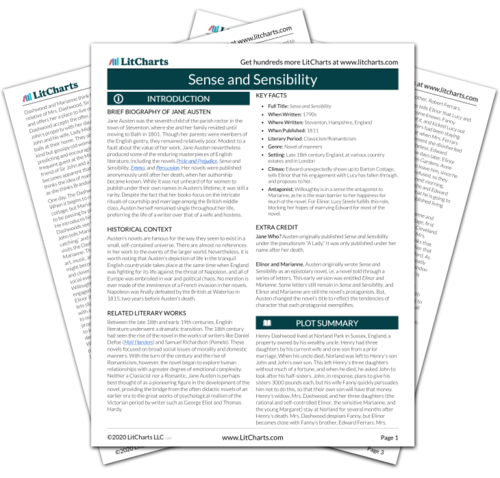 Get the entire Sense and Sensibility LitChart as a printable PDF. At this point, Robert Ferrars entered. John went to go get Fanny, and Robert began talking of Edward. He laughed at the idea of Edward becoming a priest. Elinor couldn’t help but show her contempt for Robert in her expression. Robert said that he pitied Edward, and called Lucy “the merest awkward country girl, without style, or elegance, and almost without beauty.” Robert and Elinor were interrupted by the entrance of Fanny. Elinor dislikes Robert’s arrogant character, and even she is unable to restrain herself from displaying her distaste for him. Robert has his own, prejudiced idea of Lucy’s character. Elinor is not particularly fond of Lucy, but does not have this low of an opinion of her. Fredericksen, Erik. "Sense and Sensibility Chapter 41." LitCharts. LitCharts LLC, 3 Mar 2014. Web. 21 Apr 2019. Fredericksen, Erik. "Sense and Sensibility Chapter 41." LitCharts LLC, March 3, 2014. Retrieved April 21, 2019. https://www.litcharts.com/lit/sense-and-sensibility/chapter-41.